I think this is the first time I’ve posted back-to-back in 7 years! Anyway, I wanted to give you a heads up on what I’ve been doing these last few weeks. I’ve been reshaping and in some cases redesigning some game mechanics, partly because I felt the game needed it, and partly because the tester feedback has been a pleasant eye-opener for some things. One of the cooler new things is the feel of Alicia’s horizontal movement. The controls feel miles more tight now: if you hold down the d-pad, she moves; if you don’t, she stops right away. This allows her to jump around and evade attacks with much more precision, and it makes a world of difference in many situations. She feels a lot like Alucard’s movement in SOTN! Another addition is a checkpoint system, which triggers during important events, letting you get back there if you die, as opposed to going back to the last save-station. I’m using it sparingly, but if you think that’ll make the game too easy, I’m considering doing a newgame+ mode that turns this off, among some other changes. Might be fun! Finding new uses for the Seeing Stone! Other than that, I extended the first dungeon by adding a couple of puzzles spread across 4 rooms (shown above!). I also redesigned the fire spell (which now feels like playing pinball with grenades!) and buffed the ice spell with an area-of-effect attack. I also added an upgraded charged strike to strengthen Alicia’s whip, which grows as she levels up. Some of this cool stuff will be showcased on video soon (for the first time in years!). There’s some exciting things happening in the next few months, so look forward to that! Woaw. The animation of Alicia pushing this crate is just so damn cute ! 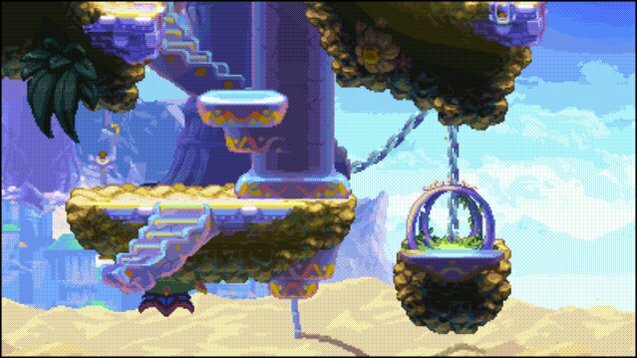 This is some of the bext pixel art and animation I’ve seen in a good while. I can’t wait for the day when I can give you money so I can play this. That said! 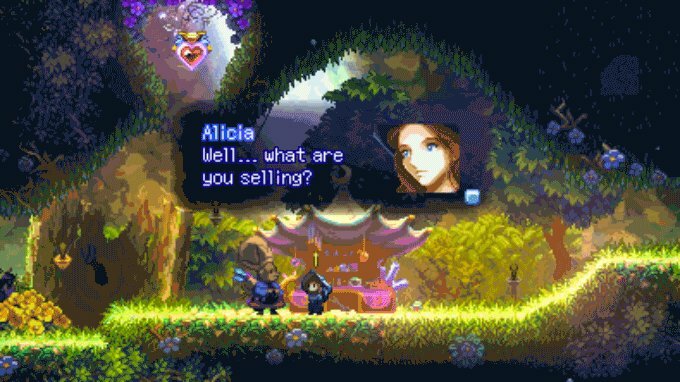 The timed door platforming business was my least favorite part of Valdis Story, and I’m kinda bummed to see it in HFA too. Still, this is high on my (admittedly short) list of day-one purchases. Thanks a lot, Jake! There won’t be that many main-game situations with timed-door puzzles. In this case, it’s just a dungeon mechanic to get you to use your first spell in a new way. With that said, though, I’ll try to be mindful of the use of timed-doors in the future. I don’t mind timed doors. In Valdis story you had to be on 0.0067 sec right to make it. From gif I can see there is some second/s left. :o) so don´t worry, if you do it right that. How about giving an option to turn off checkpoints right away? Or maybe having it as a difficulty setting available from the beginning?